If you are reading this blog post, you are probably considering an interactive trivia game for an upcoming trade show (or a series of trade shows). This post will outline 5 different trivia games we offer and help you select the best one for your booth. Each version is made to better help you achieve your trade show goals of booth traffic, awareness, and engagement. All of our interactive trivia games include game play on iPads and Leaderboards. In addition, you should assume that the branding and game theme will be based on your branding. All games tie into our data and analytics backend to measure player performance, content understanding and measuring learning objectives. Booth visitors try to advance through 5 different levels answering between 3-10 questions per level. They play until they get three wrong answers or the questions run out. This is our first version of trivia and our most popular. Excellent for teaching booth visitors and attendees your content. Non-timed game encourages attendees to talk more with your booth staffers. Longer game play draws a crowd at the booth. Questions are randomized so each time you play the questions are different. Levels that allow people to advance. 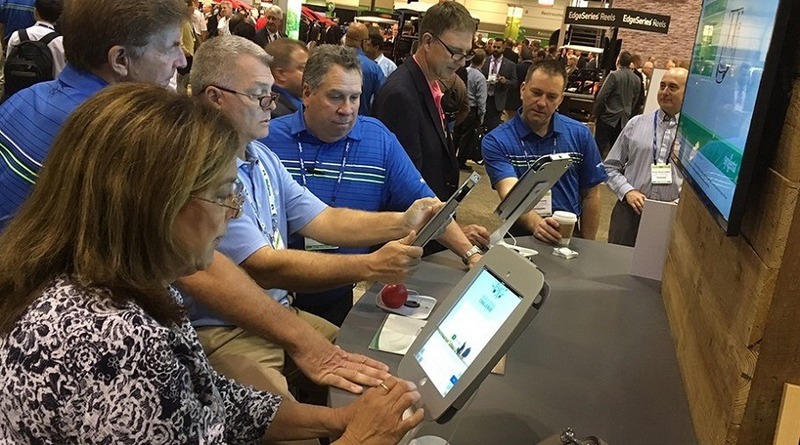 Booth visitors earn points for answering interactive trivia game questions quickly – the faster they answer, the more points they get for a right answer. If you have ever played bar trivia this game, then you have an idea of how this game works. Encourages booth visitors to answer quickly and then move onto the next activity. Excellent alternative to testing when you need to evaluate content. Set the number of questions. Multiple booth visitors join the same game and answer the same questions at the same time. This interactive trivia game requires a host who will push questions to the tablets. Scores from that round are recorded on a leaderboard. With the host, you can position the game as an “event” in your booth. More attention-getting than other versions of trivia. Host picks the questions and the number of questions. Question point values can be setup in advance. Booth visitors get a fixed amount of time to answer as many questions as they can. Think about it as a two-minute drill: How many questions can you answer in two minutes? Players earn more points for getting on a scoring streak and answering multiple questions in a row correctly. Allows you to limit the total time of the interaction. Streak scoring rewards players for getting multiple questions correct in a row. Perfect interactive trivia game for events where you want attendees to answer questions in a particular order. Allows you to move attendees through a series of questions in a particular order. You set the order of the questions. All questions are the same and in the same order. Questions can have different point values. Our interactive trivia game is a proven activity for getting trade show attendees into your booth. But exhibitors have different reasons for exhibiting and different plans for how they want to engage prospects in their booth. That’s why we’ve configured our trivia game to be activated in these 5 versions you to select the version that best fits your trade show objectives.